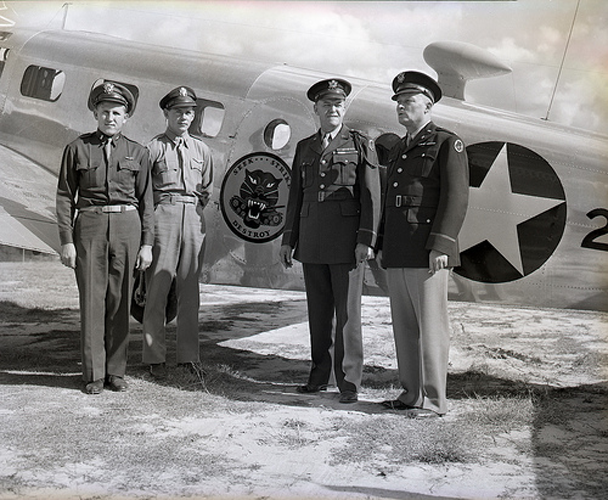 Major General Andrew D. Bruce, second from right, stands with Camp Hood's official plane. 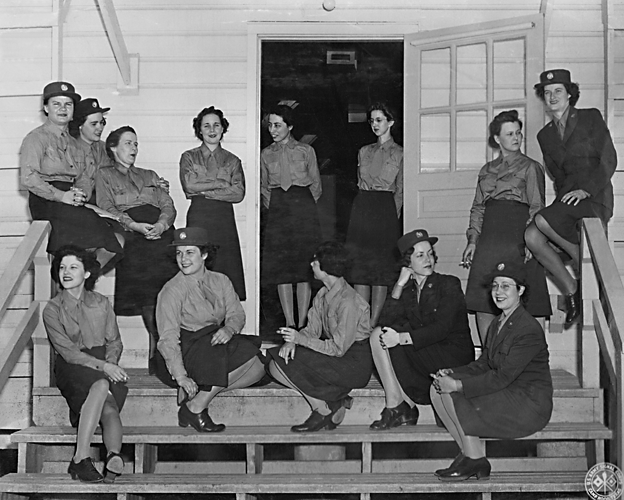 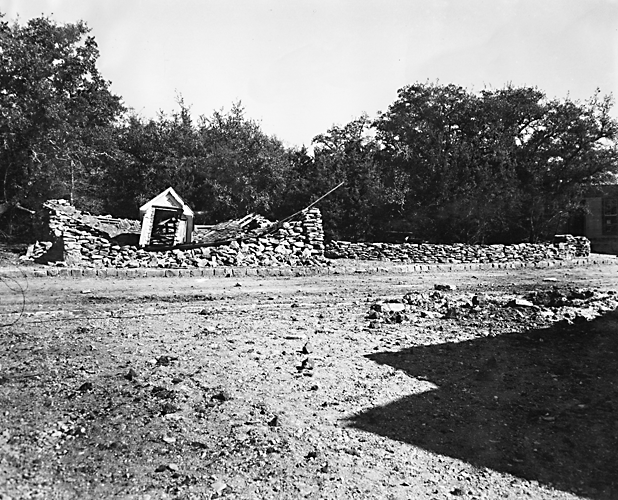 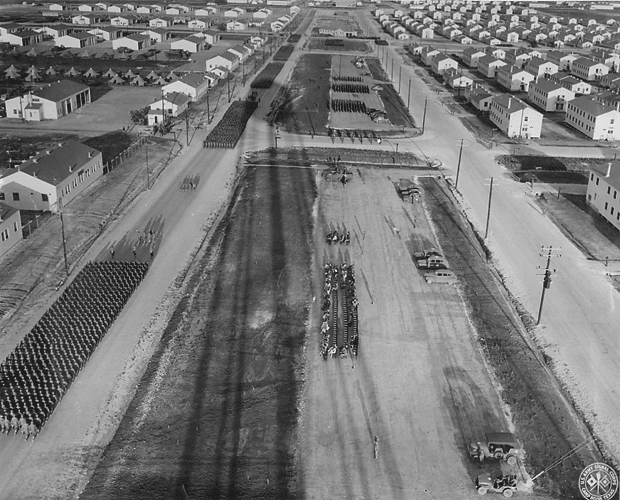 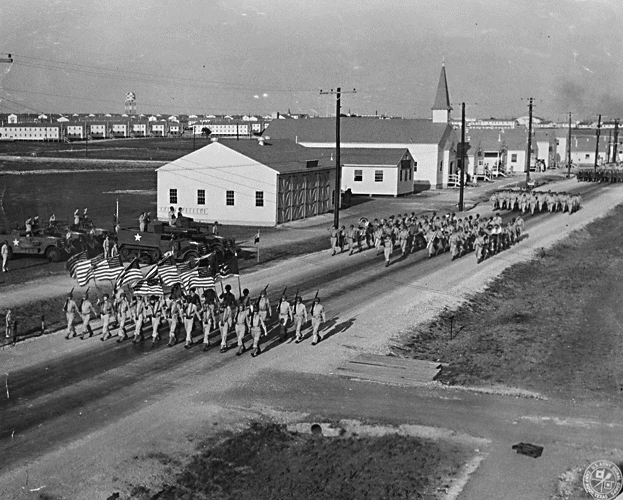 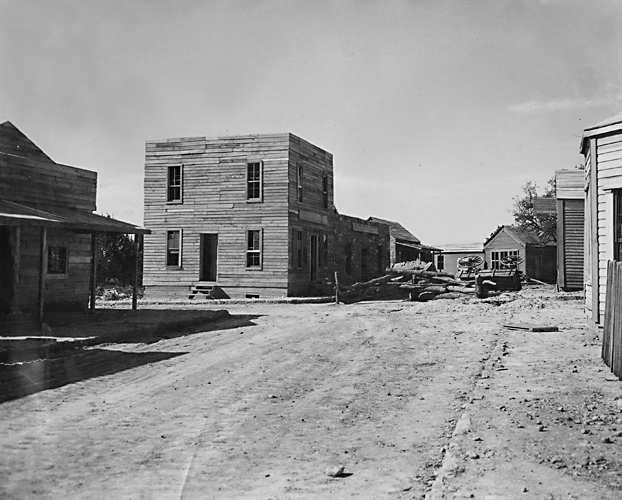 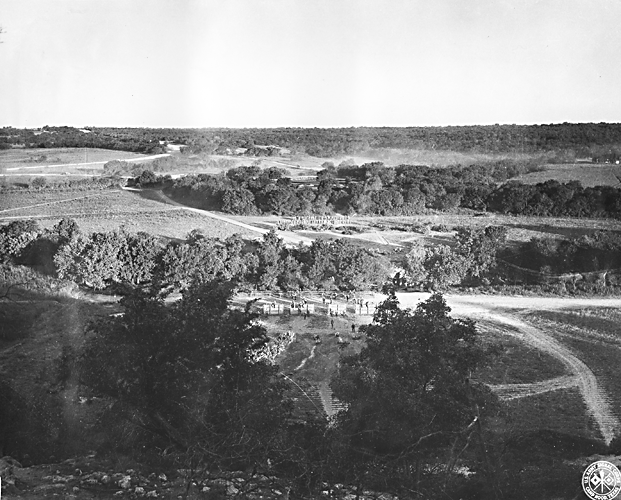 Photo provided courtesy of the MCoE (Maneuver Center of Excellence) Museum Division Archives, Armor Branch. 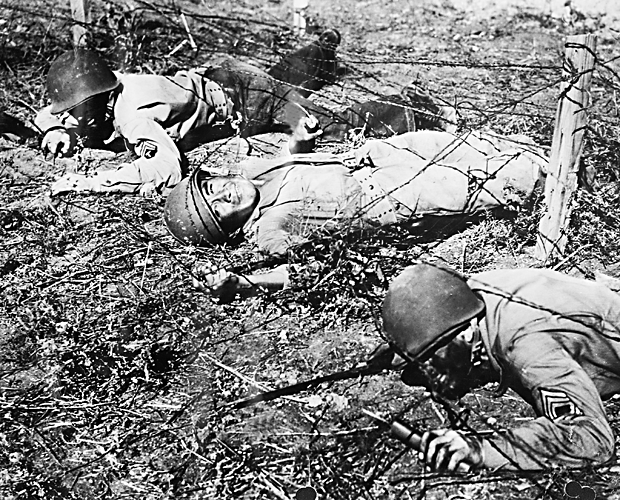 Three soldiers crawl under barbed wire as part of their training. 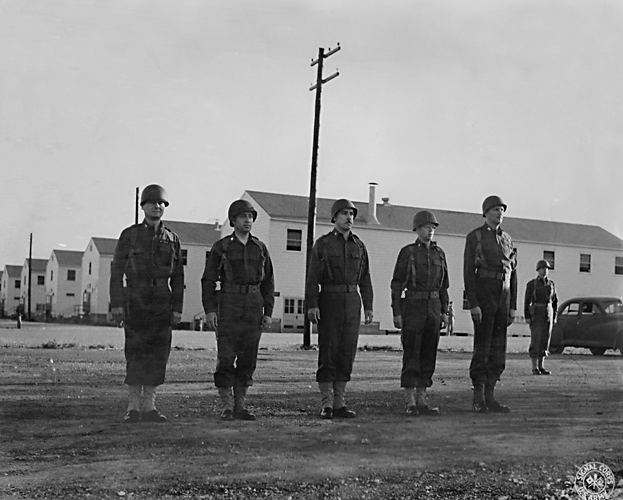 Photo provided courtesy of the MCoE (Maneuver Center of Excellence) Museum Division Archives, Armor Branch. 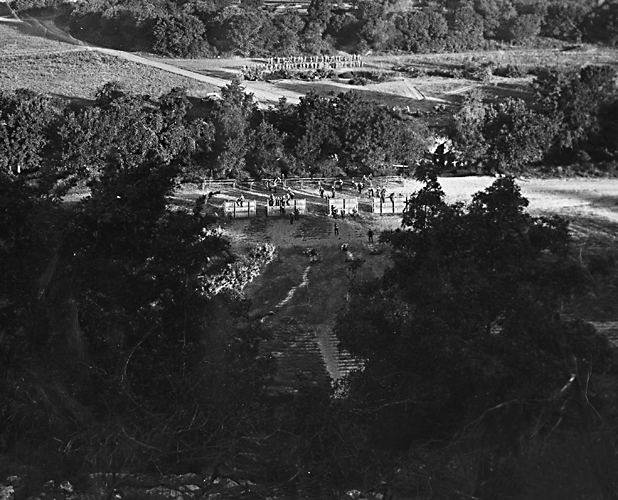 A somewhat closer view of course #1 and its obstacles. 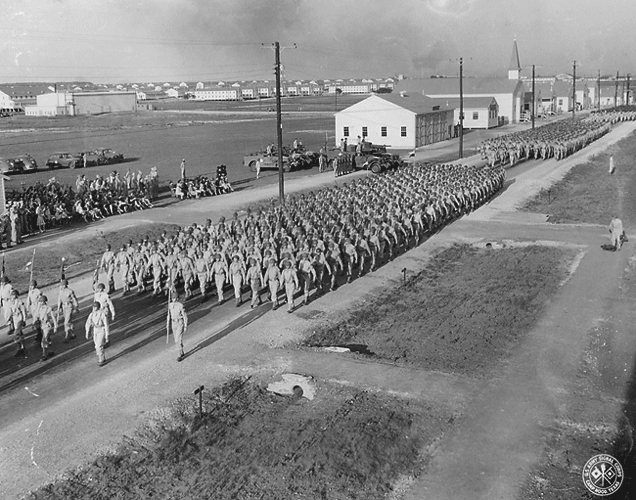 Photo provided courtesy of the MCoE (Maneuver Center of Excellence) Museum Division Archives, Armor Branch. 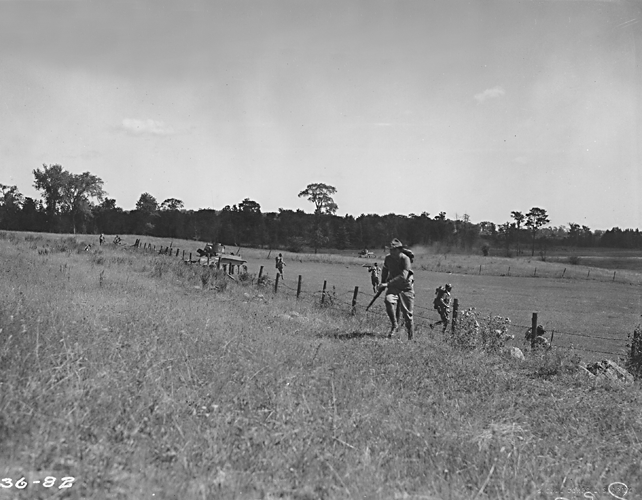 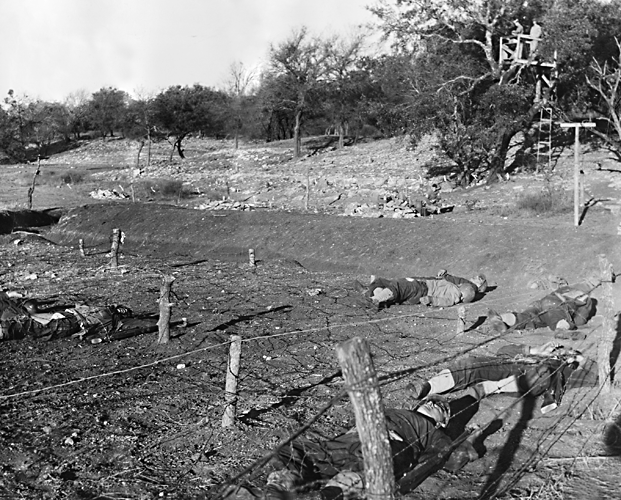 Soldiers crawling through an area covered by barbed wire. 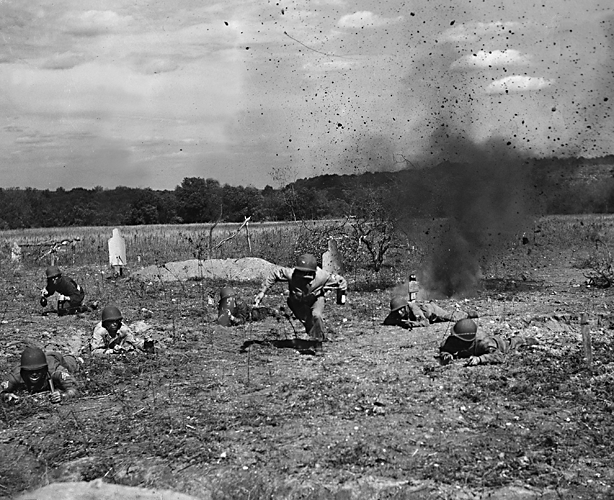 Although hard to see, there is a man firing a machine gun, just over their heads. 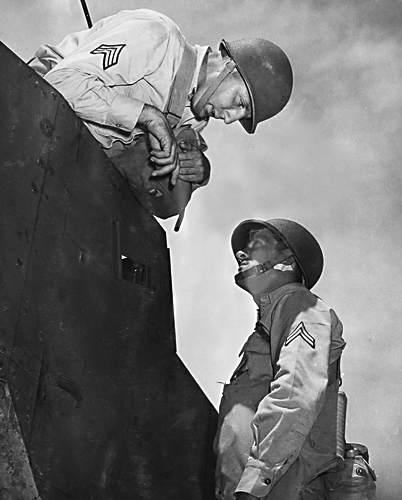 Photo provided courtesy of the MCoE (Maneuver Center of Excellence) Museum Division Archives, Armor Branch. 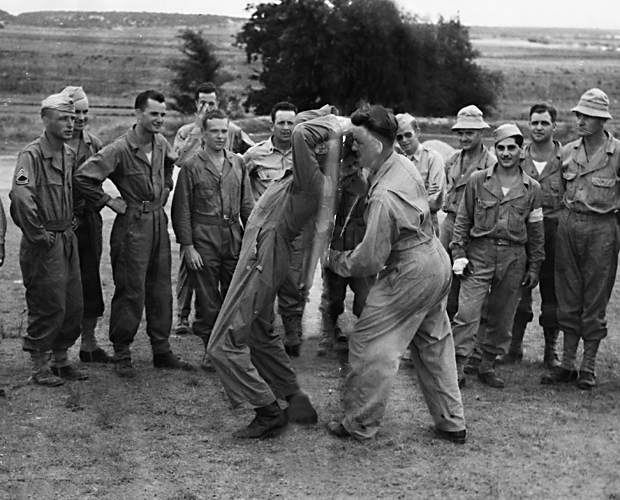 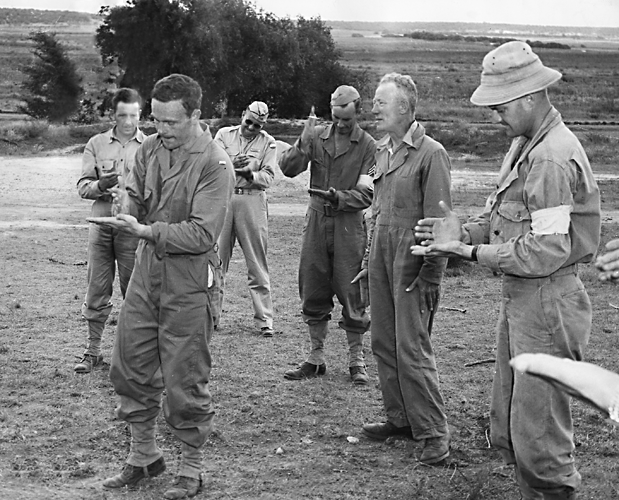 Soldiers review their striking technique for hand-to-hand fighting. 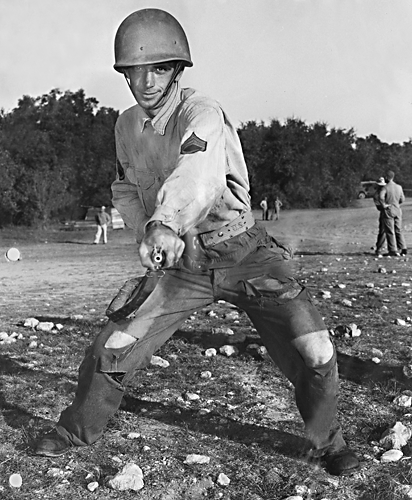 Photo provided courtesy of the MCoE (Maneuver Center of Excellence) Museum Division Archives, Armor Branch. 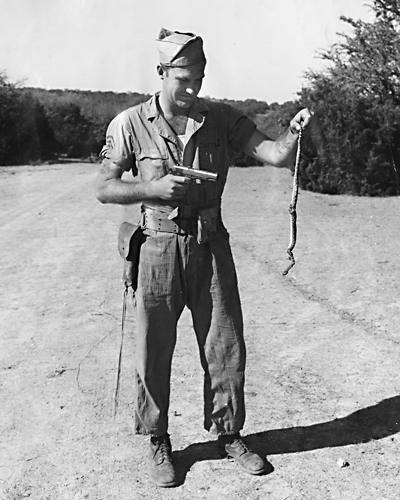 Snakes were a concern throughout the entire Camp Hood facility. 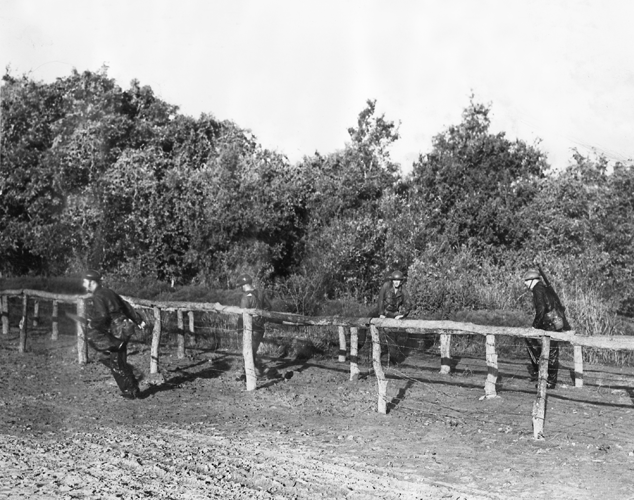 They also made for interesting targets with a handgun. 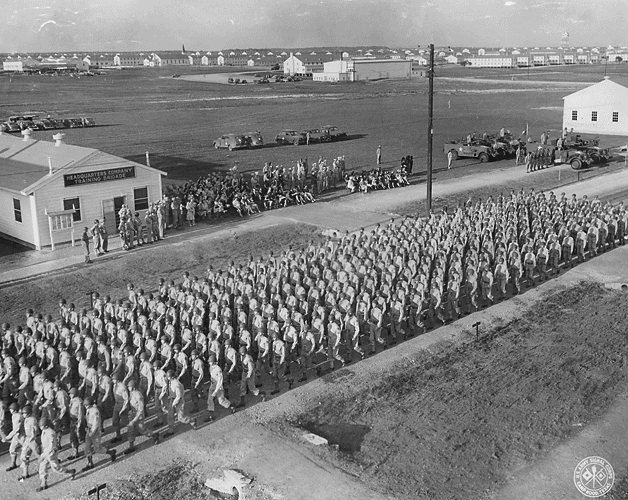 Photo provided courtesy of the MCoE (Maneuver Center of Excellence) Museum Division Archives, Armor Branch. 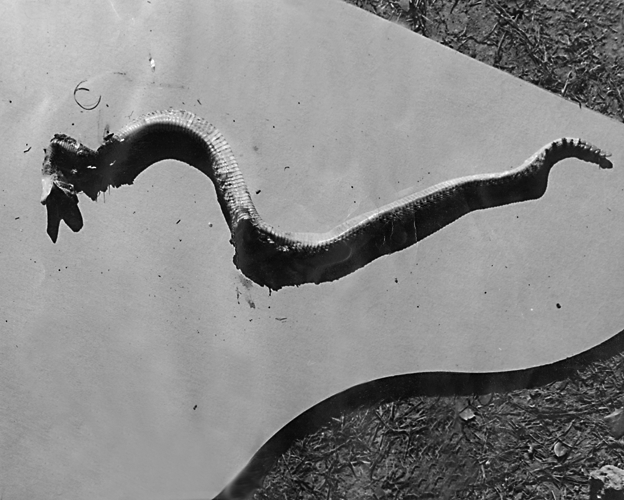 Close examination of the snake clearly identifies that it did not die naturally. Photo provided courtesy of the MCoE (Maneuver Center of Excellence) Museum Division Archives, Armor Branch. 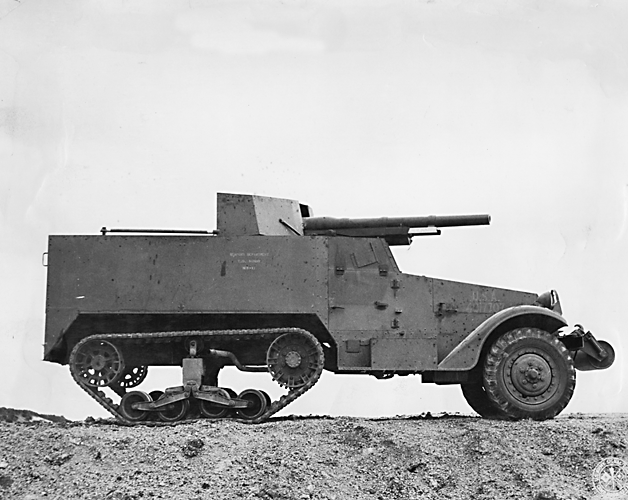 A right side view of the M3 GMC (Gun Motor Carriage). 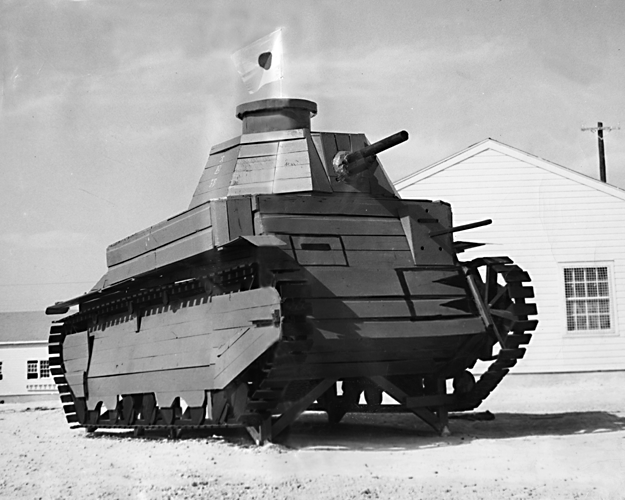 The unit was equipped with a 75mm gun and had a top speed of about 43 mph. 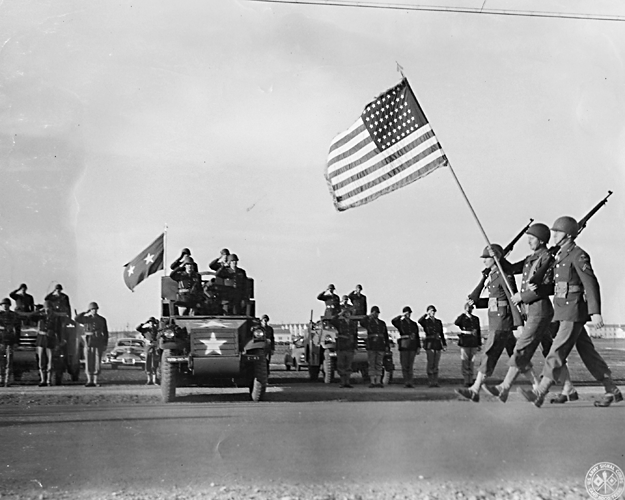 Photo provided courtesy of the MCoE (Maneuver Center of Excellence) Museum Division Archives, Armor Branch. 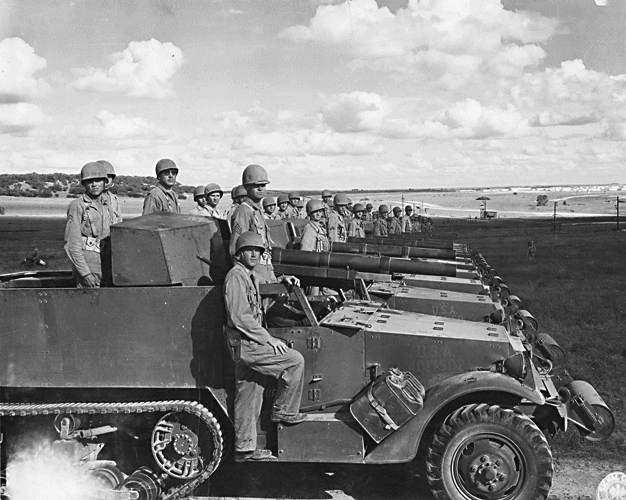 Lines of M10 GMC (Gun Motor Carriage) units stand in wait for training exercises. 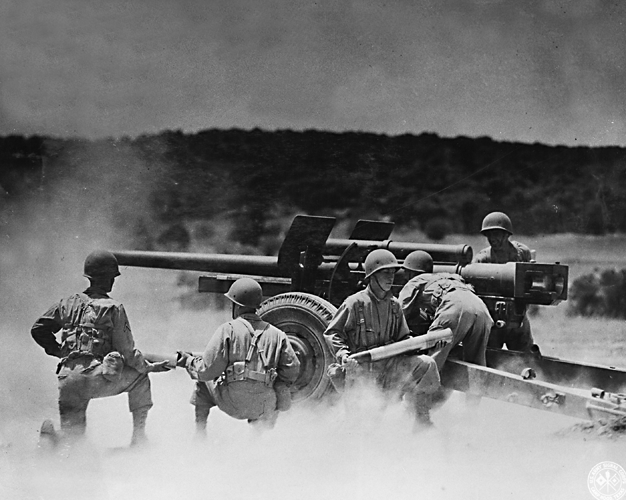 The M10s were equipped with a 3 inch gun and had a top speed of about 32 mph. 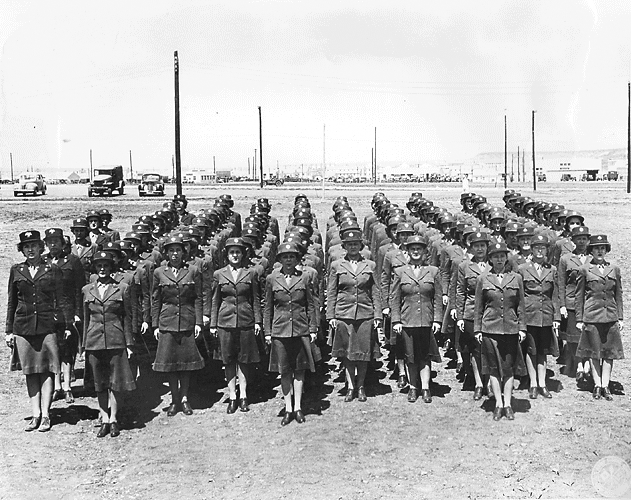 Photo provided courtesy of the MCoE (Maneuver Center of Excellence) Museum Division Archives, Armor Branch. 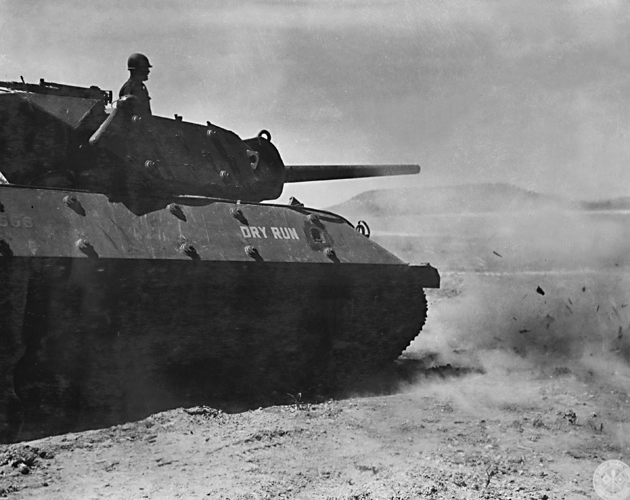 An M10 GMC fires at a distant target. 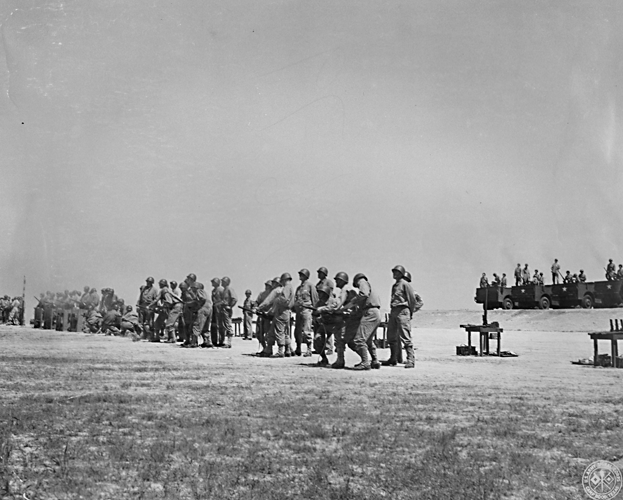 The unit is nicknamed "Dry Run" possibly because it was being used for practice rather than enemy targets. 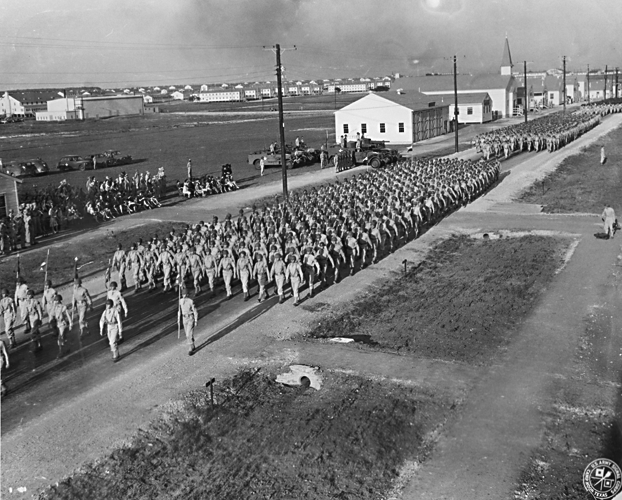 Photo provided courtesy of the MCoE (Maneuver Center of Excellence) Museum Division Archives, Armor Branch. 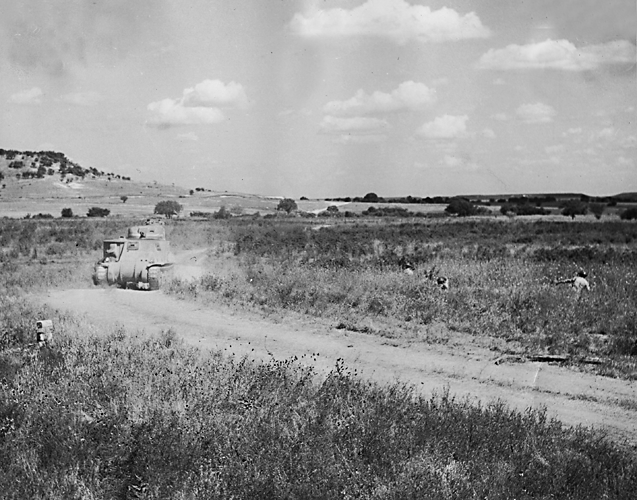 An M10 takes a cross-country drive over rough terrain. 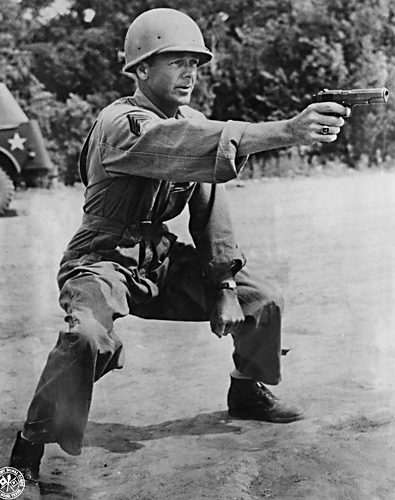 Note the gun is pointed rear-ward in the travel position. 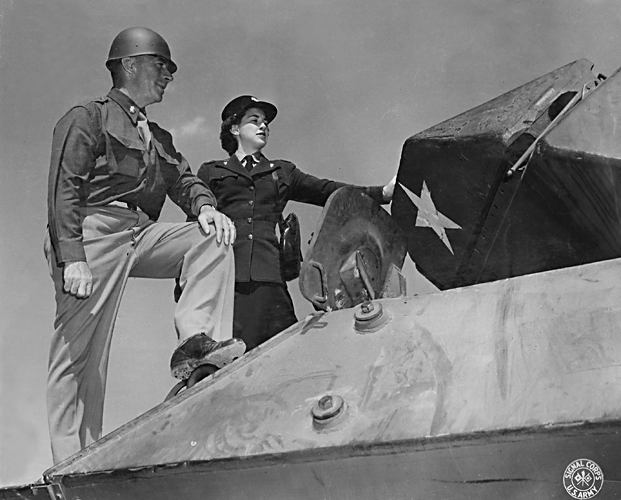 The driver and assistant driver's heads can be seen on the right and left, just above the hull, below the turret. 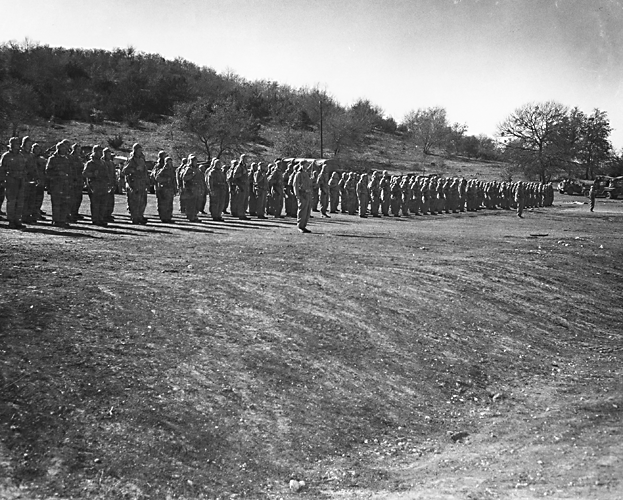 Photo provided courtesy of the MCoE (Maneuver Center of Excellence) Museum Division Archives, Armor Branch. 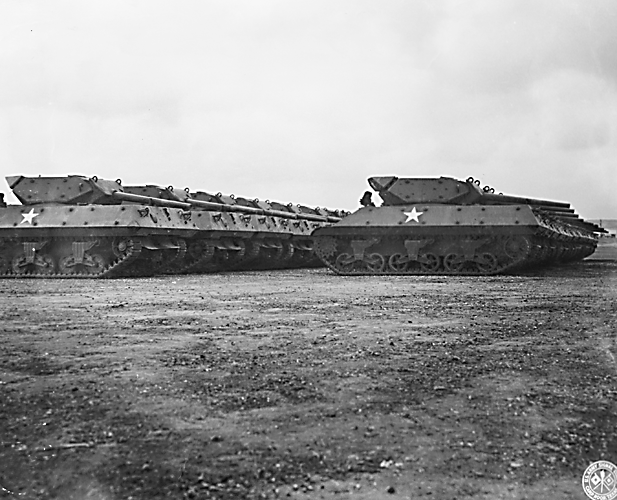 Another photo of an M10's cross-country movements. 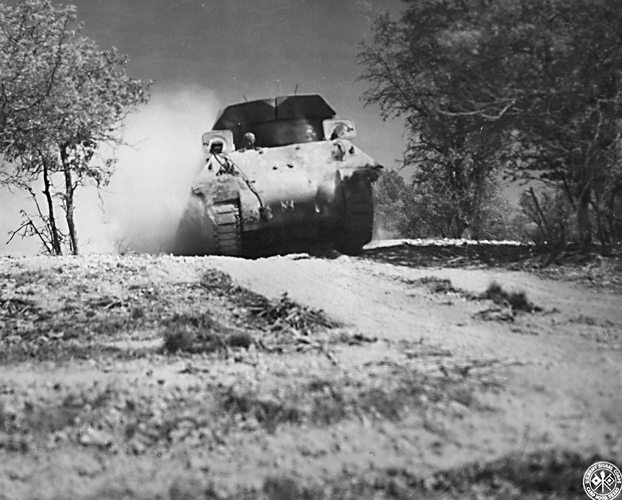 The M10 is probably moving at top speed since the left track is partially off the ground. 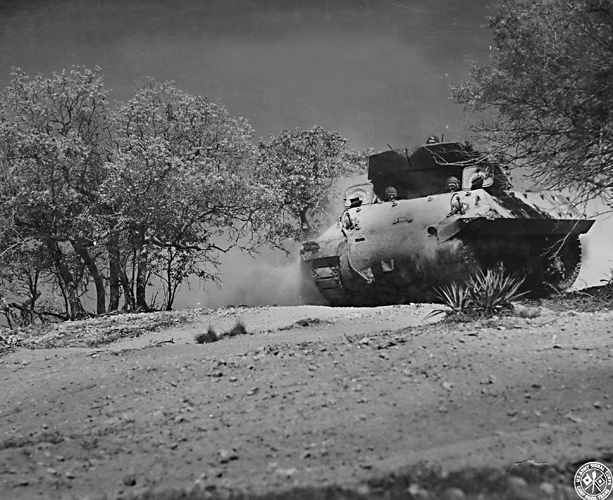 Photo provided courtesy of the MCoE (Maneuver Center of Excellence) Museum Division Archives, Armor Branch. 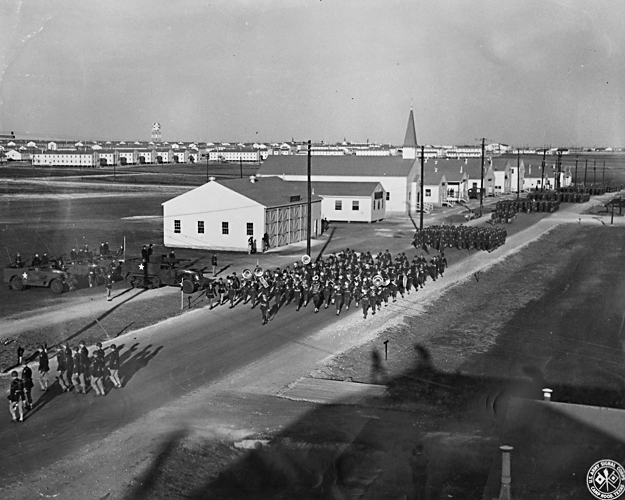 Battalion Inspection. 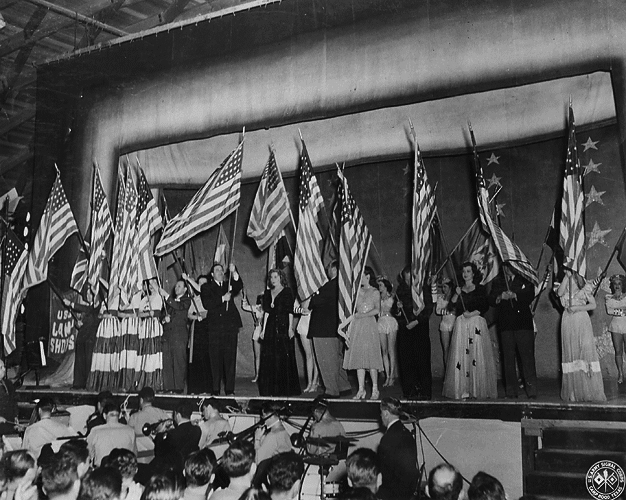 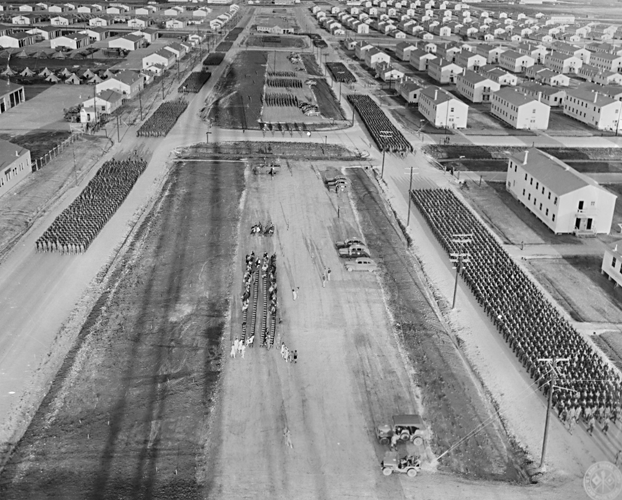 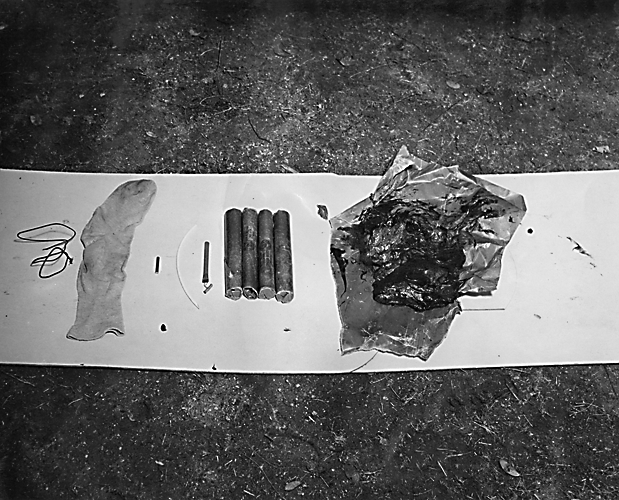 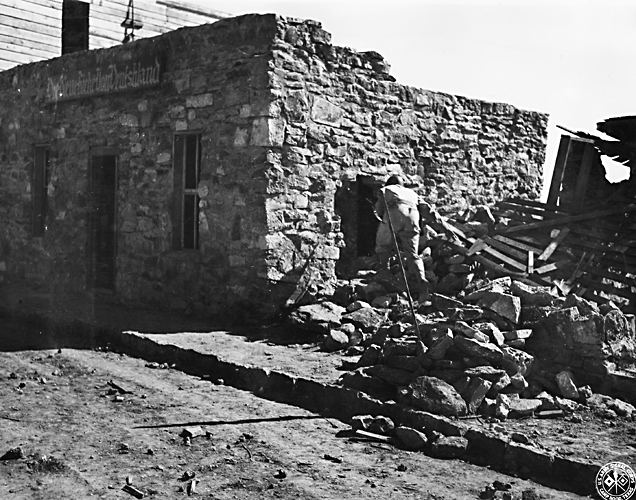 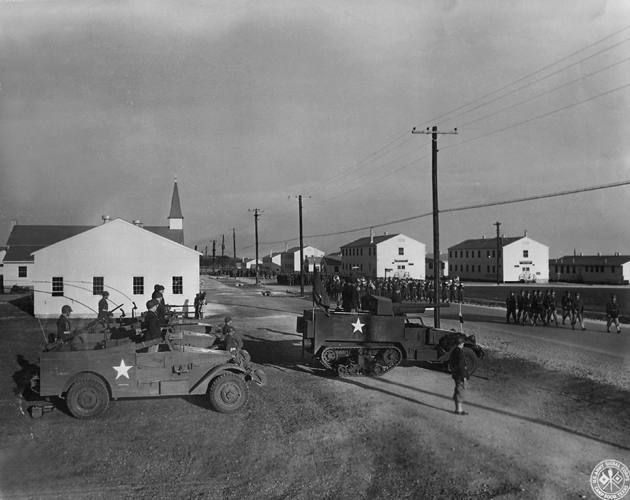 Photo provided courtesy of the MCoE (Maneuver Center of Excellence) Museum Division Archives, Armor Branch. 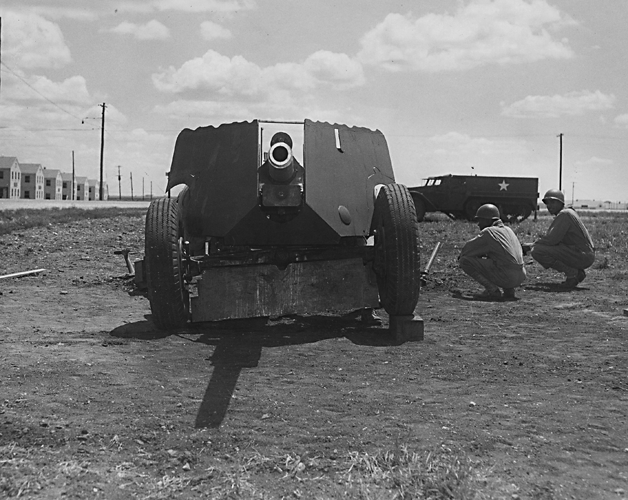 A towed 3" anti-tank gun being used for target practice. 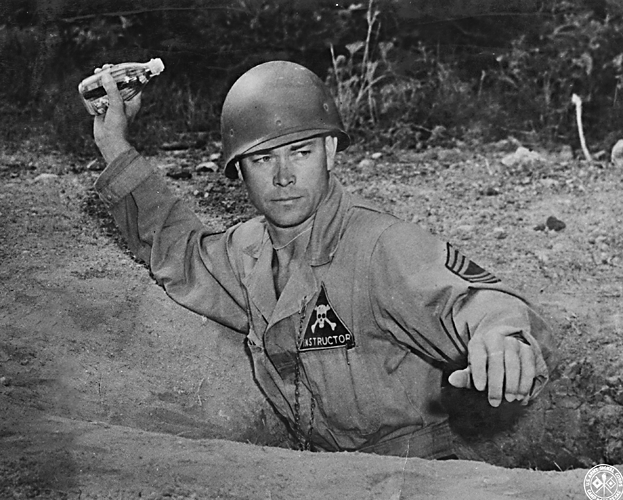 Photo provided courtesy of the MCoE (Maneuver Center of Excellence) Museum Division Archives, Armor Branch. 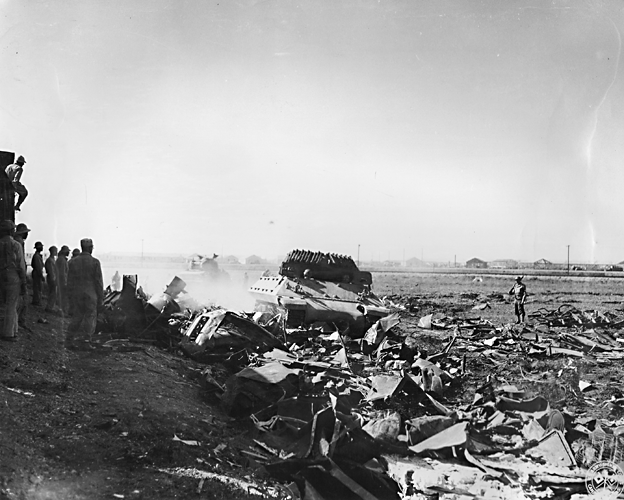 An M10 traverses a field of debris. 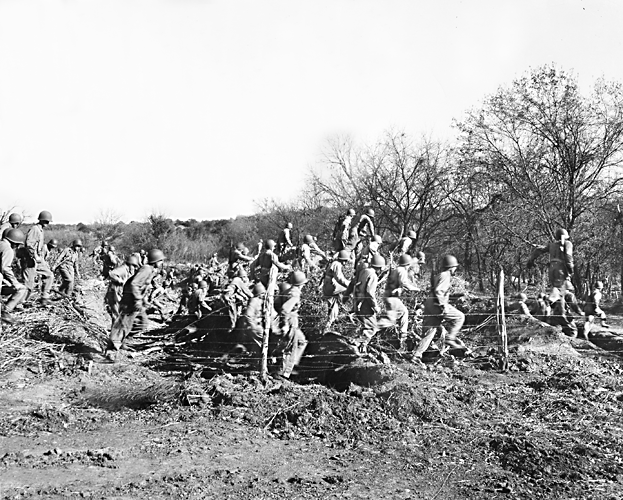 Photo provided courtesy of the MCoE (Maneuver Center of Excellence) Museum Division Archives, Armor Branch. 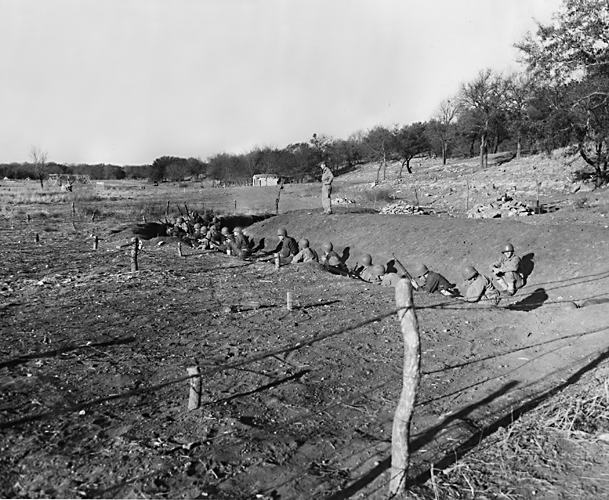 Soldiers practice on the range with what looks like Browning air-cooled .30 caliber machine guns. 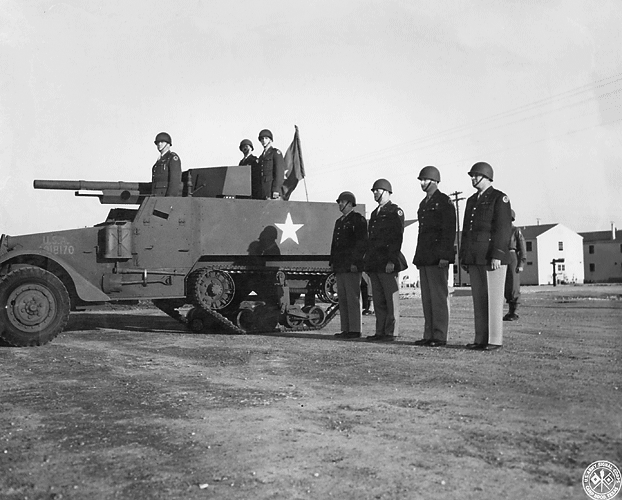 Photo provided courtesy of the MCoE (Maneuver Center of Excellence) Museum Division Archives, Armor Branch.